Would you believe me if I said I could take the guilt out of potato chips?Discovering this recipe may have become a game changer. Potato chips are a huge weakness on mine. A normal serving of chips is only 15 but it is so hard to stop once you start. Well I have found the best guilt free and super easy chip recipe on the planet. 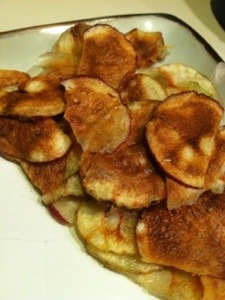 The most important part of this recipe is to use a mandolin or box grater slice potatoes thin into chips. Put all the sliced potatoes into a bowl, add salt, oil and mix gently by hand. Next, spray a large round dinner plant with non-stick cooking spray and lay potatoes out in one single layer on the plate. You will have enough potatoes to make 4-5 batches so take your time and make sure potatoes don’t overlap. Time for the magic. Place one plate at time in the microwave UNCOVERED for 4 minutes. Chips will brown and get crispy. Make sure to spray the plate lightly with each batch. Enjoy!